The third International aHUS Awareness Day is September 24, 2017. 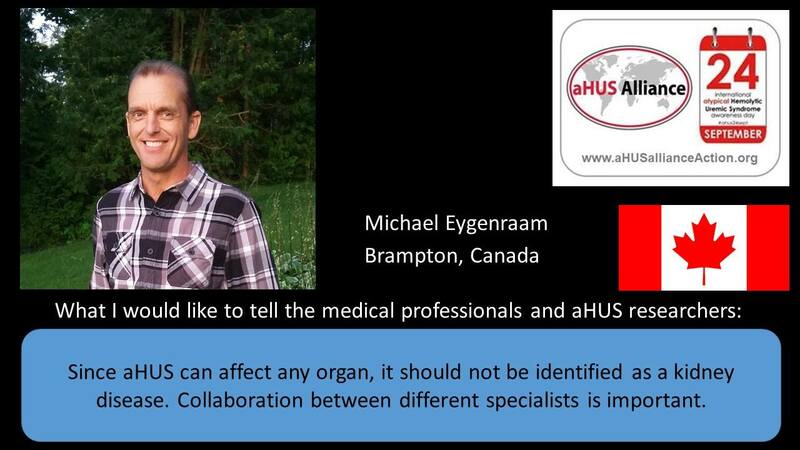 The aHUS Alliance, an international group of atypical HUS patient organizations, founded this day three years ago to bring awareness to the issues aHUS patients are facing and sharing information and insights into Atypical Hemolytic Uremic Syndrome. Atypical Hemolytic Uremic Syndrome is an ultra-rare, life-threatening, disease characterized by the systemic formation of blood clots (TMAs) throughout the body, often causing damage to the kidneys and other organs, with serious complications including stroke, cardiac issues, and kidney failure. It is often associated with an uncontrolled activation of the complement system, part of the body’s protective immune system. In preparation of aHUS Awareness Day the aHUS Alliance hosted a TMA symposium in Boston a month ago on August 24. It was a great day of presentations of clinicians with the patient voice included from three different nations including Canada. The entire day was video taped and the different sessions are now published in time for aHUS Awareness Day on the Atypical HUS Clinical Channel . A great way to learn more about TMA and aHUS and the importance of the Patient Voice included! The patient voice is also very important with the Health ministries as there is still the lack of access to proper treatment in some provinces in Canada. More than four years have passed since Health Canada approved eculizumab in 2013 for the treatment of aHUS, yet eculizumab is still not accessible to all aHUS patients in all provinces in Canada. This needs to change. 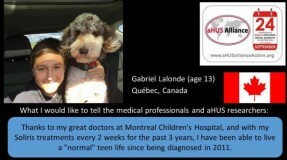 aHUS patients are frustrated and continue to suffer unnecessarily. 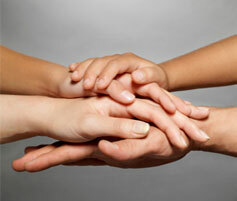 If you are having issues with access please voice your concern and together we can make a difference. With awareness, education and collaberation we can improve the lives of aHUS patients.